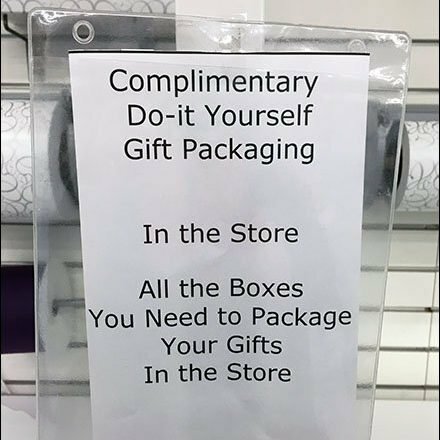 Though this is Do-It-Yourself Gift Wrap In Store by customers. the retailer offers generous support in terms of work space, tools, tape, Gift Wrap, and even boxes. Work stations were created from a Slatwall back, Grid dividers, and Grid-Mount solid shelves. Step through the gallery for a full range inspection. Scroll down for more Gift Wrap merchandising in outfitting.